Biplab Kumar Deb is credited with building the party virtually from scratch in Tripura. A BJP assessment in 2017, the party said, showed that Biplab Deb was more popular than Manik Sarkar in Tripura. Biplab Kumar Deb took charge as BJP chief in Tripura in January 2016. 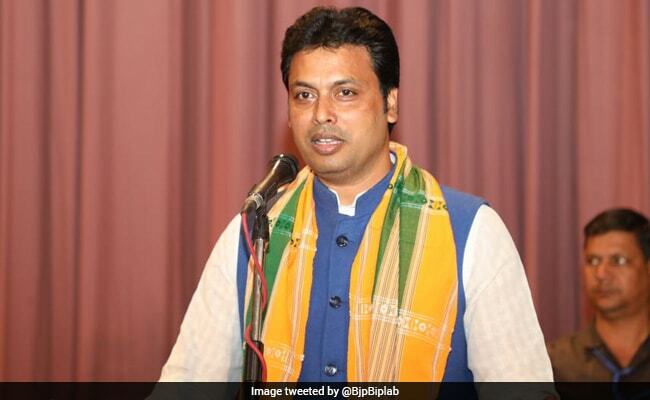 Agartala: Biplab Deb, 48-year-old Tripura BJP chief, has been elected by party legislators as their leader in the state assembly and is expected to take oath as chief minister on Friday, March 9 at a grand ceremony likely to be attended by Prime Minister Narendra Modi and where the BJP plans to showcase its many chief ministers from around the country. Union minister Nitin Gadkari, who oversaw today's meeting of the newly-elected BJP legislators, announced that Mr Deb had been chosen to be chief minister. Mr Deb said senior BJP leader Jishnu Debbarma will assist him as deputy Chief minister. Mr Gadkari is now leading the BJP delegation to the Raj Bhawan, where Mr Deb will stake claim to form govermment. The BJP posted a stunning victory on Saturday winning 35 of Tripura's 60 assembly seats - 43 along with a regional ally - and ousting Left party CPM, which was in power for 25 years.